With the early childhood eating habits of toddlers and young children, it is no surprise that preschools and child care centers often have problems with ants and cockroaches. Schools for the state’s youngest residents may also have concerns about black widow spiders, yellow jackets, mosquitos, rodents and other pests. Many of the centers respond to the problem with pesticide sprays and foggers that could expose children and staff to residues on surfaces and in the air, a 2010 survey by the California Department of Pesticide Regulation revealed. California’s Healthy Schools Act requires DPR to collect information about pesticide use and pest management in child care centers. The 2010 survey found that 55 percent of child care facilities use pesticides and 47 percent use foggers. One in five of the centers scheduled pesticide applications on a weekly or monthly basis, a strategy that is not recommended because applications may take place even when no pests are present. The Healthy Schools Act also requires DPR to develop programs that encourage the facilities to voluntarily adopt integrated pest management practices, which emphasize pest monitoring, exclusion and safe treatment. Instead, users are advised to keep ants out by caulking cracks around foundations, removing plants and mulch that are within 12 inches of building foundations and removing ants’ food, water and shelter opportunities inside the facility. If other action must be taken to control the pest, IPM suggests the use of baits, not sprays, and as a last resort, hiring a pest management professional. The curriculum can be downloaded for free from UCSF’s California Childcare Health Program website, http://www.ucsfchildcarehealth.org. 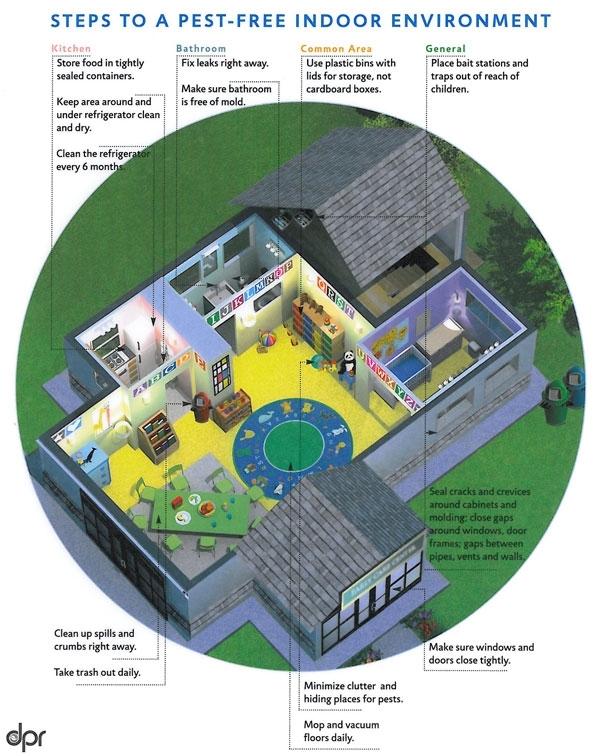 IPM techniques make child care centers a safer place for children.